You've probably heard about autonomous cars by now - but what about a self-driving garden? 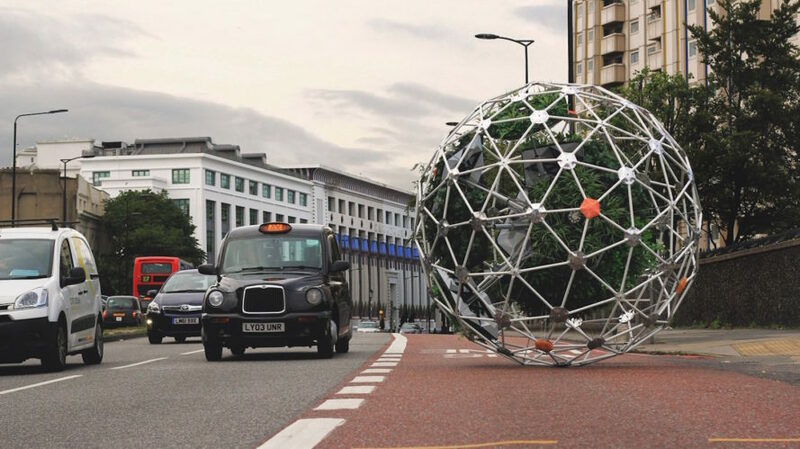 University College London’s (UCL) Interactive Architecture Lab designed and built a nomadic, self-driving, and self-cultivating garden that they’ve named Hortum machina, B (the ‘B’ is short for Buckminster ‘Bucky’ Fuller). 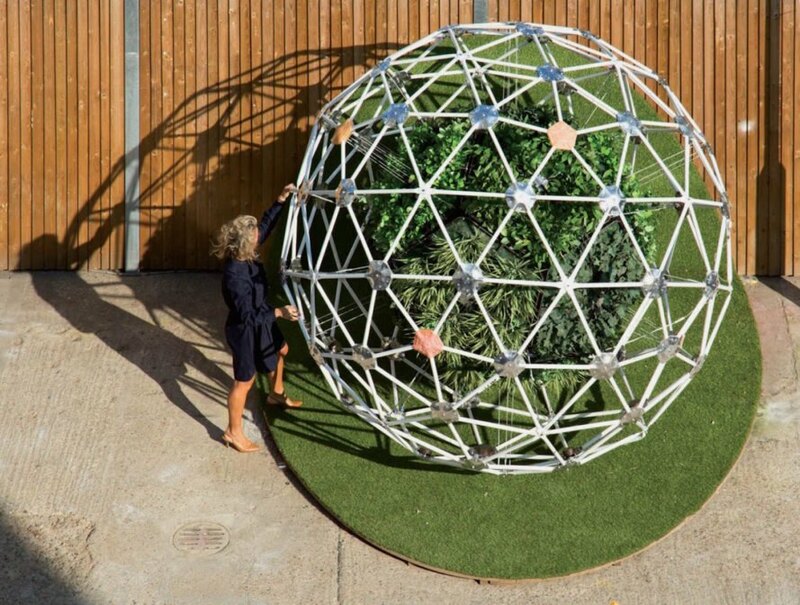 Encased in a large geodesic sphere, the modular garden is wrapped around a robotic aluminum core that monitors the plants’ responses to the environment and is able to propel the structure towards sunlight to best satisfy the garden’s needs. J. R. R. Tolkien’s Ents, a race of anthropomorphic tree creatures, belong to the fantasy world, but the moving and autonomous Hortum machina, B is rooted firmly in reality. Designed by UCL students William Victor Camilleri and Danilo Sampaio under the supervision of the Interactive Architecture Lab’s director Ruairi Glynn, Hortum machina, B draws inspiration from Buckminster Fuller’s landmark book ‘Operating Manual for Spaceship Earth’ and his geodesic domes. The mobile ecosystem uses a network of electrodes to monitor the garden’s physiological responses to the environment and then, using this data, propels the sphere into motion. For example, if the plants at the bottom of the sphere lack direct light, the individual panels begin to shift until those plants are sufficiently lit. The robotic core can also move the sphere to a new location if the garden requires shade or if air pollution levels are unhealthy. Hortum machina, B was tested in London. All plants in the garden are native to Greater London and the machine is powered by an attached solar panel. The unit also has built-in water storage. The experimental project was seen as a way to expand the reach of London’s green space to new terrain. Designed by UCL students William Victor Camilleri and Danilo Sampaio under the supervision of the Interactive Architecture Lab’s director Ruairi Glynn, Hortum machina, B draws inspiration from Buckminster Fuller’s landmark book ‘Operating Manual for Spaceship Earth’ and his geodesic spheres. For example, if the plants at the bottom of the sphere lack direct light, the individual panels begin to shift until those plants are sufficiently lit. The mobile ecosystem uses a network of electrodes to monitor the garden’s physiological responses to the environment and then, using this data, propels the sphere into motion. The robotic core can also move the sphere to a new location if the garden requires shade or if air pollution levels are unhealthy. Hortum machina, B was tested in London. All plants in the garden are native to Greater London and the machine is powered by an attached solar panel. The experimental project was seen as a way to expand the reach of London’s green space to new terrain.